Saturday August 11th , meet us at The Lake for an all out, all white summer midnight yacht party filled with chill vibes, drinks, good music, and of course, exceptional views of that famous Chicago skyline. 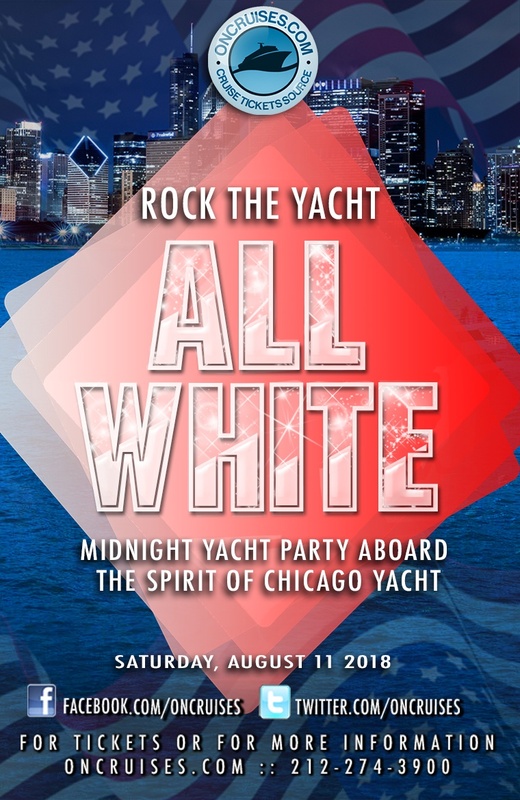 The Rock The Yacht: All White Midnight Yacht Party is coming, and you don’t wanna miss this super dope Chicago yacht party! You’ll be boarding the Spirit of Chicago Yacht for a night of incredible fun. The vessel itself is one behemoth of a boat, with four floors, and that’s including an observation deck at the top. So get your phones out cause this cruise will give you amazing views of Chicago landmarks like Jardine Water Purification Plant, the Aon center, and the rest of the gorgeous Windy City skyline. You’ll have enough space to move around, and dance the night away, and we want you to have that energy cause we’ve got a live DJ determined to ensure good vibes with a night of the hottest Pop, Dance, Hip-Hop, Electronic, and Top 40 hits. You could also enjoy a nice friendly game of giant jenga. That means come in your crispiest all white attire. Enjoy the summer night’s breeze and let one of the bartenders fix you up a premium cocktail, just make sure don’t spill any on yourself, or anyone else for that matter. Keep scrolling down and order your ticket(s)! Hey, you know those amazing pics and vids you’ll be taking the whole night? Post em’ up on social media and let everyone know your were living your best life on the hottest yacht party in Chicago! While you’re at it, don’t forget to tag us on Instagram, Facebook, and Twitter! Use #OnTheLake so everyone knows where the party’s at!